Slam balls are versatile pieces of equipment, suitable for beginners and seasoned exercisers alike. 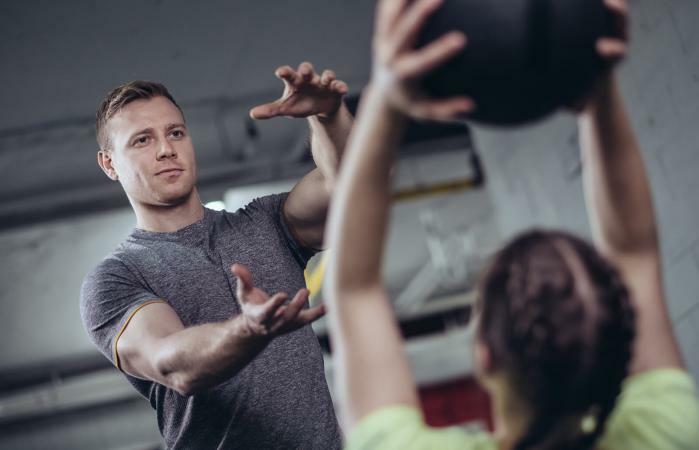 Grab a ball and get started with this whole-body workout that combines strength work with cardiovascular exercise for a complete workout session. Don't skip the warm up and cool down. Take 3-5 minutes for your warm up and around five minutes for your cool down. Both help you avoid injuries and soreness and are beneficial to your body. After your warm up is complete, move into the working portion of the workout. Each exercise should be done for 45 seconds immediately followed by a 15 second recovery period to catch your breath and hydrate. Follow this pattern (45 seconds on, 15 seconds off) three times for each exercise. Place the slam ball at the opposite end of the room. Jog to the ball, touch it, then run back to the other side of the room. These can be sprints if you want to go harder, but jogging will certainly get your heart rate up too. These drills are primarily cardiovascular, yet will help strengthen your calves, quads, and glutes. With the ball in both hands, lunge with the legs while reaching the slam ball to the side with the forward leg. Alternate sides, ensuring the twisting motion with the ball is done carefully and methodically as to avoid lower back strain. These work your glutes, hips, hamstrings, and quads along with the obliques. Place the ball on the ground. Keeping your knees soft and your core tight (squeeze your glutes), jump over the ball and back. Follow this with lateral jumps, side to side over the ball. This is a cardiovascular exercise, but will also target your quads, hamstrings, and calf muscles. Standing with feet no wider than hip-distance apart, knees soft, hinged at the hips with back straight, grasp the ball with both hands, palms facing inward. Pull the ball toward you, squeezing your shoulder blades together as you pull. Release, still squeezing, and return the ball to the dropped position. This move works your latissimus dorsi (a big muscle in your back) along with your shoulders and arms. Holding the ball in both hands with palms facing inward in front of your chest, drop into a deep squat. Shoot yourself back into an upright position, heaving the ball overhead. Either toss it against a wall and then catch it, or you can simply toss it up and catch it without hitting a wall. While the squats work the lower body, the ball toss targets more of the upper body, making this an excellent full-body exercise. Either on your knees or your toes, get into a push up position with the ball directly under your chest. Place your hands on top of the ball and balance Push ups work a variety of muscles and can be quite challenging when balancing on the slam ball. Modify this move by placing only one hand on the ball, which is still challenging but does not require as much balance. Hold the ball either close to your chest (easiest), extended outward in a static hold (harder), or overhead (hardest) while doing high knees, which is similar to an in-place jog, but with knees drawing up higher each time. This compound move works your lower and upper body while also taxing your cardiovascular system. Assuming a four minute warm up and a five minute cool down, this entire workout should take 30 minutes. Advanced exercisers can double the workload by going through the set of drills twice (3x45 seconds twice instead of once each). How frequently you do this workout depends on a variety of factors, including your fitness level, goals, and existing workout schedule. Keep in mind that experts recommend adults get at least 150 minutes of exercise a week (or half an hour every weekday) but those trying to lose fat should strive for five hours of exercise a week alongside a comprehensive nutrition program. This workout is designed to take about 30 minutes to complete including the warm up and cooldown, so do it as frequently as necessary to meet your exercise goals alongside your other workouts. Make this workout as intense as possible without overdoing it. 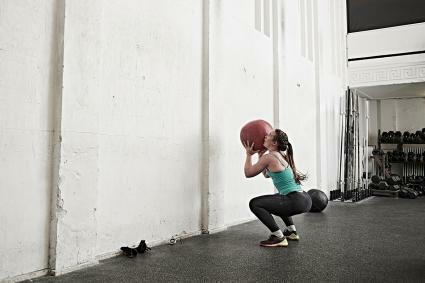 Increase intensity by using a heavier ball (decrease for less intensity) and take breaks as necessary. If a move feels odd or is painful, stop what you're doing and try a lighter weight or modify to remove whatever feels off. For example, if the lunge with the oblique twist makes your lower back ache, simply remove the oblique twist and do the lunges either without the ball or with the ball held tightly to the chest. Consult with a fitness professional if you have questions about form or further increasing intensity.